1 Philippine Institute of Volcanology and Seismology. 2 Department of Geology and Geological Engineering, Michigan Technological University, Houghton, MI 49931 USA. 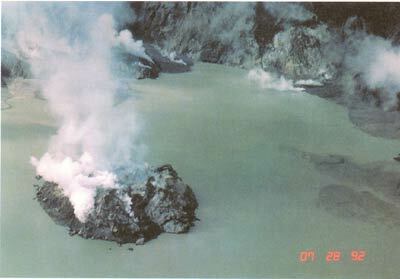 An andesitic lava dome grew on the floor of the new caldera of Mount Pinatubo between July and October of 1992. Growth was continuous, with rates of about 8 x104 cubic meters per day for the first 10 days and about 3 x104 cubic meters per day thereafter until the end of October. Activity during 1993 was limited to phreatic explosions on and around the dome. The 1992 dome is similar in composition and texture to another dome that formed in the same area during the week preceding the climactic June 15, 1991, dacitic eruption. Samples of both domes contain disequilibrium mineral assemblages and quenched mafic inclusions. These textural features, as well as chemical compositions of minerals and whole rocks, indicate that both were produced by mixing of basalt and dacite. Least squares modeling of major element compositions and differences in trace element abundances of 1991 and 1992 samples suggest that the 1992 andesite represents a new episode of magma mixing. Breakdown of cummingtonite in a sample of the 1992 dome indicates that more time elapsed between mixing and eruption in 1992 than in 1991. In 1991, mixing of basalt and dacite and ascent of mixed andesite was followed within a week by major explosive eruptions of dacitic magma. In contrast, ascent and eruption of andesite in 1992 did not trigger explosive eruptions of dacitic magma, possibly because volatiles in the dacitic reservoir were depleted by the 1991 eruptions. 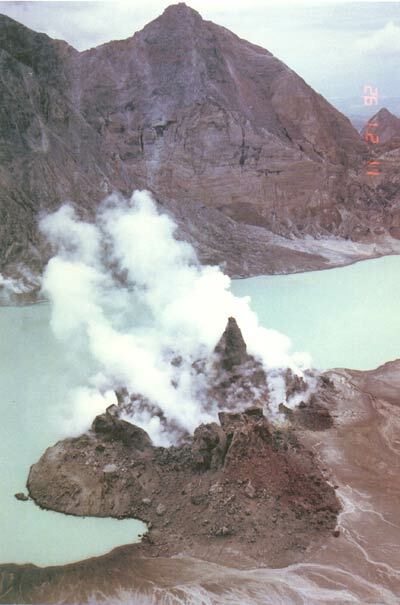 An andesitic lava dome was extruded onto the north flank of Mount Pinatubo between June 7 and June 12, 1991, preceding the large explosive eruptions of andesite and then dacite on June 12-15. This dome was destroyed during the climactic eruption of June 15, 1991. Minor dacitic eruptions continued until early September of 1991, after which the volcano entered a period of temporary repose. Geologic evidence for dome growth late in the latest prehistoric eruptive period (Buag eruptive period; Newhall and others, this volume) suggested that further dome growth was possible. On July 3-6, 1992, seismicity signaled renewed magma ascent, the onset of a new period of dome growth, and, potentially, more explosive eruptions. Although the topography and presumably the internal structure of the summit area were strongly modified by caldera collapse on June 15, 1991, the 1992 dome grew in the same geographic position as the 1991 dome. In addition to being erupted in the same place, available samples and observations indicate that the 1992 dome is compositionally similar to its 1991 counterpart. These similarities pose an important question: Does the 1992 dome represent a new magma mixing episode, and, if so, why has it not triggered another explosive eruption? This paper describes the growth and composition of the 1992 lava dome and attempts to answer this question. Difficult access and safety considerations prevented detailed measurements and detailed sampling of the 1992 dome. The following discussion is based on aerial oblique photographs and video (high and low angle) and one brief visit to the dome for sampling. Dimensions of the dome are estimated from photographs; the caldera and caldera lake were used for scale. They are approximate, as are calculated volumes. Judging from repeat trials in volume estimation by different coauthors, we believe the precision on volume estimates is +-30 percent. The samples described in this report were obtained from the dome during a brief visit by helicopter on December 4, 1992. Seismic records are principally from station FNGZ, 9 km southeast of the dome, and are supplemented after August 9 by records from station CRAZ, newly installed on the north caldera rim, 1 km north of the dome (see Mori, White, and others, this volume; Ramos and others, this volume). SO2 gas monitoring was by an airborne COSPEC (Correlation Spectrometer; Barringer Instruments) (Daag, Tubianosa, and others, this volume). May to June 1992: Sporadic low-frequency harmonic tremor (average frequency, 1 Hz). July 3: The first low-frequency volcanic earthquake during this period of seismic unrest. July 6: Sudden increase in the number of small, shallow, low-frequency volcanic earthquakes and in low-level, low-frequency tremor, suggesting possible magma ascent. A low-frequency appearance raised immediate concern about the potential for explosive activity as well as dome growth. July 7: Aerial reconnaissance showed a brown, turbulent plume of sediment in the caldera lake; the plume was elongate in a west-southwest to east-northeast direction. The sediment plume suggested either heating and turbulent convection of lake water or sublacustrine mud explosions. 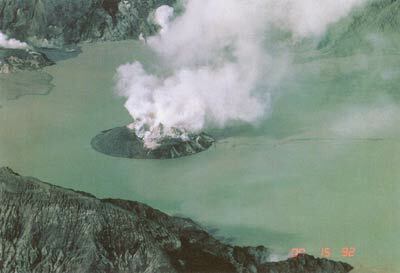 July 9: Explosions from beneath the shallow caldera lake (possibly beginning on July 8) built a small, roughly 50-m-diameter tuff cone above lake level by 0830 on July 9 (Lieutenant Scheidegger and Major Caldwell, U.S. Marine Corps, oral commun., 1992). By the time we observed the island at 1400 on the same day (fig. 1), it was circular, approximately 70 to 100 m in diameter, and 5 m high. Small phreatic explosions from a 10- to 20-m-wide vent on the north-northwest side of the cone were shooting fountains of steam and mud 50 to 200 m into the air at intervals of several minutes. Steaming from fumaroles around the south shore of the caldera lake was notably less than it had been before July. Nighttime observations by Captain C. Owens (U.S. Marine Corps, oral commun., 1992) from 1900 to 2100 showed that explosions were continuing. The products were not hot enough to appear bright when viewed through night-vision goggles. Figure 1. Small tuff cone being formed on July 9, 1992. View is from the northwest. July 10: The tuff ring had grown to 100 to 150 m in diameter and 5 to 10 m high. The size and frequency of explosions might have decreased; only one of two observation flights saw explosions, which were smaller than those seen on July 9. Video footage from that flight showed interbedded light and dark layers in the tuff cone, possibly representing an alternation of juvenile and accidental material. Steaming along the south shore of the caldera lake that had noticeably diminished on July 9 returned to precrisis (pre-July) levels. Seismicity was limited to a few high-frequency volcanic earthquakes. July 11-13: Observations were interrupted by passage of Typhoon Eli (local name, Konsing). Occasional low-frequency harmonic tremor. July 14: A new dome was sighted during a flight at 1000; seismicity indicates that it may have begun to grow late on July 13 (Ramos and others, this volume). A steep-sided jumble of jagged, light-brown, ash-dusted blocks occupied what had been a water-filled vent for phreatic explosions and was steaming profusely. When first sighted, the dome was about 50 m in diameter and 5 to 10 m high and had a volume of between 104 and 105 m3 (table 1). July 15: Jagged spines developed on the dome, and portions of the uplifted tuff cone slumped into the lake (fig. 2). Figure 2. Early dome growth, July 15, 1992. Dome had been growing for 1 or 2 days and was shouldering aside (and burying) unconsolidated debris of the tuff cone. View is from the north. Table 1. Growth of the 1992 lava dome. July 16: Two days after it was first sighted, the dome had roughly doubled in diameter (now about 100 m), grown to a height of about 30 m, and occupied about 60 percent of the 150-m-diameter island. Steep sides and jagged spines suggested a dacitic composition, though later sampling showed only andesite. July 23: The tuff cone was now completely covered (or shed) by the new dome, and a talus slope was developing on the north side of the dome. July 24: The dome had grown to 200 m in diameter and 50 m high and had two 25-m-wide lobes of lava on its west side. July 28: The dome had become structurally complex, with numerous fractures and fumaroles. The most profuse steaming was along a north-south fracture cutting at least the northern half of the dome (fig. 3). Blocks of talus several meters in diameter lay on the lake floor, partly submerged, immediately east, north, and southwest of the dome. Figure 3. Expanded dome, July 28, 1992, as seen from the north. Note individual boulders lying partially submerged in shallow water around the dome. July 30: The dome appeared to have flattened, due to lateral spreading. August 5-9: The dome appeared to have a central vent, which was later seen to be a spreading center with a north-south axis. Smooth faces of fresh, viscous lava formed where lava had risen and peeled apart along a north-south fissure and had not yet been broken by endogenous growth. The dome as a whole was also slightly elongated north to south, with an average diameter of about 200 m and a height of about 50 m. On August 5, the amplitude of low-frequency volcanic earthquakes began to increase; earthquake traces were emergent, with indistinct P-wave arrivals at FNGZ. A new seismic station (CRAZ) was installed on the north caldera rim on August 9 to get a closer look at this seismicity. August 10-11: Uplift of the north side of the dome and adjacent lake bottom, probably a result of sublacustrine endogenous dome growth, had created a 50-m-wide "beach" on which several previously submerged "marker blocks" were recognized (fig. 4). The northern half of the dome was higher than the southern half. Figure 4. Dome on August 10, 1992, with an expanding northern lobe, including a small beach, and what appears to be a craterlike feature above the original vent. View is from the northeast. 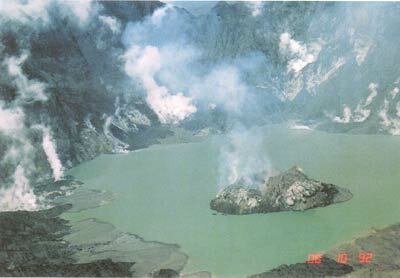 August 12 and subsequent days: Intense rain raised the lake level and submerged the "beach" on the north side of the island, as well as other shorelines of the caldera lake. August 15: A new family of shallow, low-frequency volcanic earthquakes appeared, with a dominant frequency of 1.25 Hz. P-wave arrivals were emergent but recognizable. August 24: Another family of low-frequency volcanic earthquakes appeared, with a dominant frequency of 2 Hz. P-wave arrivals were emergent but recognizable. August 26: Growth had shifted to a new, eastern lobe. Uplift on the east side of the dome had created a new, 50-m-wide eastern "beach." The dome continued to grow and by now had 3 peaks (north, southwest, and east) and a small topographic low (crater?) within the southwestern high. North-south and east-west dimensions were both about 300 m; the maximum height was 50 to 100 m.
August 27-September 2: Heavy rains caused the lake level to rise. However, continued uplift of the eastern lobe of the dome kept the eastern "beach" above lake level. On or before August 29, westward aggradation of an apron of debris that had washed from the eastern wall of the caldera, combined with uplift of the dome itself, joined the island to the eastern lake shore. On August 30, a new family of low-frequency volcanic earthquakes began, and these were of larger amplitude than any earlier in the 1992 unrest. Dominant frequency was 1.25 Hz. September 2: The eastern lobe continued to grow, increasing the east-west diameter to about 350 m and the volume to about 2x106 m3. The eastern shore of the lake also continued to aggrade, so the eastern lobe of the dome was surrounded by a debris apron, which sloped gently toward the lake. September 13: The appearance of yet another family of low-frequency volcanic earthquakes of small magnitude was recorded only at the CRAZ station. September 18: The eastern lobe was areally smaller but steeper and taller than the northern lobe. Most steaming was from vents in the southwestern area. September 22-26: The dome continued to grow slowly and now measured about 300 m north-south (unchanged) and about 400 m east-west (increased). The highest point on the dome was on the southeastern lobe, about 70 to 100 m above lake level; two high areas on the northern lobe were about 50 m above the lake. September 28: Horizontal dimensions of the dome were unchanged: the height appeared to have increased slightly. October 1-10: No significant changes were noted. October 15: Renewed uplift of the northern lobe caused several huge blocks to spall off and tumble to the north foot of that lobe. Uplift accompanied an increase in small earthquakes, recorded at CRAZ. October 23: Seismicity increased sharply; low-frequency volcanic earthquakes were occurring at a rate of 1 per minute (see fig. 8). October 28-30: A fresh spine of dark lava protruded 30 to 50 m above the north-central lobe. The south-central part of the dome also expanded (fig. 5). Total volume of dome was now about 4 x106 m3. Figure 5. Dome on November 21, 1992, essentially unchanged since late October. The spine on the northern lobe formed partly by extrusion during October 1992; it was later accentuated by collapse of surrounding material. The area southwest of the central vent has been built up slightly, and the eastern lobe is also crumbling, leaving a fragile core. Samples described in this report were collected along the upper right (north and northeast) sides of the dome. View is from the southeast. October 31: Sharp decrease in seismicity, and the apparent end of 1992 dome growth. February 1993: Shallow seismicity occurred beneath the caldera, and numerous phreatic explosion pits formed in the alluvial apron north, east, and south of the dome. The greatest concentration of explosion pits was near the southeastern corner of the caldera floor, about 400 m north of a long-standing line of fumaroles that apparently lies along a regional fault. No change was noticed in the dome itself. March-July 1993: Episodic tremor took place, possibly associated with gas venting or hydrothermal explosions from the dome or the caldera floor. The dome itself appears not to have grown since October 1992 (J. Sincioco, PHIVOLCS, oral commun., 1993). Changes in the size, shape, and volume of the dome that took place between July and October of 1992 are summarized in figures 6A-F and 7. The most notable feature is that the locus of growth shifted several times, ultimately forming two high lobes (north and east) and a third south-central lobe that rises above the original vent. Uplifting of "beaches," first on the north and later on the east, suggests that the north and east extrusions were not simply lateral breakouts from the central lobe but, rather, a sequel to intrusions and endogenous growth beneath those northern and eastern lobes. Figure 6. Sketches of the dome growth, July�October 1992. A, July 9, initial tuff cone. B, July 14, early dome set within tuff cone. C, Late July-early August, northward expansion of dome. D, Late August, eastward expansion of the dome and notable westward aggradation of the nearby shoreline, after heavy rains. E, Late September, minor additional growth of dome, but remarkable aggradation of lakeshore, partly surrounding the dome. F, Renewed growth of the northern lobe, with some growth in the southwest portion also possible, followed by crumbling of outer portions, leaving a prominent spine on the northern lobe. Steep topography is the inner caldera wall; dashed line is the shoreline of the caldera lake. Topographic base from Jones and Newhall (this volume). The dome grew continuously at roughly 0.1x106 m3/d for the first few days, 0.08x106 m3 for the next week, and then 0.03-0.04x106 m3/d thereafter until growth abruptly ended in late October (fig. 7). Similar rates of dome growth were observed at Santiaguito dome in Guatemala following the major plinian eruption of its parent volcano, Santa María, in 1902 (Rose, 1972, 1973), at Mount St. Helens, U.S.A., following its plinian eruption in 1980 (Swanson and Holcomb, 1989), at Bezymianny, Kamchatka Peninsula, following its major eruption in 1956 (Kirsanov, 1979), and at Unzen Volcano, Japan, in 1991 and early 1992 (Nakada, 1992b). However, all four of these other domes grew for a longer time than the Pinatubo dome, so they are much larger (Santiaguito, 1x109 m3 in 70 years of growth, Rose, 1987; Mount St. Helens, 7.4x107 m3 in 6 years of growth, Swanson and Holcomb, 1989; Bezymianny, 1.6x109 m3 in the first 27 years of growth, Kirsanov, 1979; Unzen, 8.2x107 m3 of lava extrusion in the first 9 months of growth, of which about half later collapsed and produced pyroclastic flows, Nakada, 1992b). Dome growth at Mount Lamington, Papua New Guinea, was even faster during a 1.4-yr period after its major eruption of 1951 (1.0x109 m3 in 1.4 years of growth, Taylor, 1958; Swanson and others, 1987). Figure 7. Cumulative dome volume, July�October 1992. An initial period of rapid growth (steep slope) was followed by slower growth until extrusion abruptly stopped in late October. Much growth of the 1992 dome was exogenous, and surface features reflected extrusion of viscous lava that spread bilaterally from its vent on top of the dome. Known as "spreading centers" (Swanson and others, 1987), "crease structures" (Anderson and Fink, 1992), "cleavage canals" (Omori, 1916), and "petal structures" (Nakada, 1992a,b), such structures have conspicuously smooth, nonscoriaceous surfaces where lava peeled apart as it spread. Outside the spreading centers, the dome's surface was initially scoriaceous and showed evidence of individual lava-flow lobes. Later endogenous growth created blocky, fracture-crossed surfaces surrounded by talus. Small spines, each roughly 10 m high, formed from time to time along the edges of spreading centers, only to collapse during continued spreading or during the next period of endogenous growth. The tallest and longest lived spine rose about 50 m above the rest of the northern lobe; it was formed partly by extrusion during October 1992 and later accentuated by collapse of surrounding material (fig. 5). During and slightly after the period of fastest dome growth (until middle August 1992), SO2 discharge averaged 580+-360 t/d (Daag, Tubianosa, and others, this volume). In contrast, the few measurements for late August-early November, when dome growth was slower, averaged 270+-40 t/d (same reference). Most of the earthquakes before and during dome growth appeared to be low-frequency events and are shown as such on figure 8. However, close inspection of CRAZ records shows that many had a high-frequency onset followed by a lower frequency coda. These may be high-frequency, brittle-fracture events at shallow depth, with direct arrivals followed by lower frequency, ground-filtered surface waves. Alternatively, both the high- and the low-frequency contents may have been source effects of fracturing in the brittle carapace of a mushy dome. Tremor that occurred shortly before and shortly after the dome began to grow had a dominant frequency of 1 Hz at the FNGZ station but was associated with steam venting and phreatic explosions. Again, path and source effects are hard to distinguish. Part of the low-frequency appearance may be a real source effect; part may be the result of attenuation of higher frequency components with travel distance, even to the closest station, CRAZ, 1 km from the dome. Details of seismicity during dome growth are given by Ramos and others (this volume). Figure 8. Earthquake counts and SO2 discharge versus time, through dome growth, July�October 1992. During the period of rapid dome growth and high SO2 discharge (late July through early August), earthquake counts were relatively low; during the period of slow dome growth and lower SO2 discharge, earthquake counts were relatively high (fig. 8). Although the correlation is imperfect in day-to-day detail, we think that the change from high SO2 discharge, low seismicity, and rapid dome growth to low SO2 discharge, high seismicity, and slow dome growth reflects progressive solidification of magma in the shallow part of the conduit and within the dome itself. Solidification may have resulted from early volatile loss, and solidification may also have trapped remaining volatiles. Thus, during the late stage of 1992 dome growth, gas-depleted, increasingly viscous magma had difficulty breaking new paths to the surface. The 1992 dome consists mainly of andesitic lava that is host to numerous inclusions. The three samples described here represent the host andesite (CN12492-1h), abundant basaltic andesite inclusions (CN12492-1i), and sparse dacite inclusions (CN12492-2). 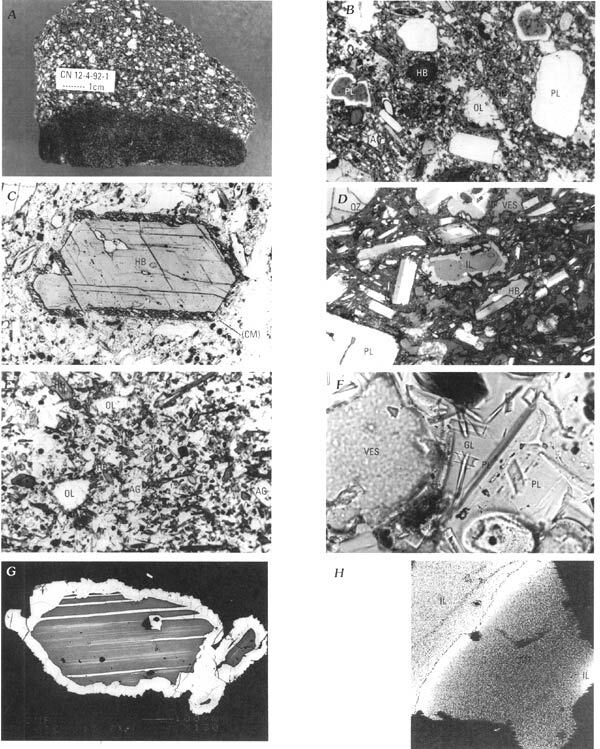 The 1992 dome andesite and the mafic inclusion samples are similar in composition, mineral assemblage, and texture to andesite and mafic inclusions from the lava dome that grew in the head of the Maraunot River valley during the week preceding the climactic June 15, 1991, eruption (Pallister and others, this volume). The dacite inclusion sample is similar in composition to dacite erupted during the climactic eruption of June 15, 1991. However, subtle differences in composition and texture suggest that the 1992 dome represents a new mixing event rather than left over hybrid magma from 1991. The dominant rock type of the 1992 dome is sparsely vesicular (10-20%) hornblende-plagioclase andesite with accessory olivine, augite, biotite, quartz, ilmenite, magnetite, and anhydrite (figs. 9A-D). This is a disequilibrium assemblage of minerals; the olivine and augite are too magnesian to be early liquidus phases, as they have magnesium numbers (100*Mg/Mg+Fe+2) as high as 86 for olivine and 87 for augite (table 2). In addition, many of the minerals have reacted with the host melt, as described below. Plagioclase occurs as relatively large (1-3 mm) euhedral to subhedral oscillatory-zoned phenocrysts and microphenocrysts. Most phenocrysts contain thin bands that are rich in glass+vapor inclusions; however, some have highly resorbed core regions and are overgrown by clear oscillatory-zoned margins (fig. 9B). The average composition is about An37, although core compositions and some zonal bands approach An60. Hornblende also occurs in two populations: unreacted, oscillatory-zoned phenocrysts (0.5-2 mm) and microphenocrysts (<0.3 mm) that have relatively high TiO2 (~2%, table 2; fig. 10) and large (1-3 mm), variably resorbed phenocrysts with lower TiO2 and Al2O3 and with augite-rich rims. In contrast to the occurrence of hornblende crystals with cummingtonite rims in the 1991 andesite, unreacted cummingtonite is not seen in the 1992 samples. Instead, the 1992 andesite contains fibrous aggregates of hypersthene that rim low-TiO2 hornblende. The occurrence of these rims on only the outer growth surfaces of hornblende phenocrysts and the similarity in thickness to cummingtonite rims in other Pinatubo rocks suggest that they are pseudomorphs after cummingtonite (fig. 9C). Accessory quartz is present as sparse large (~1 mm) grains that are resorbed (rounded or cuspate forms) and contain glass+vapor inclusions. Biotite is present both as cores to hornblende crystals and as isolated subhedral phenocrysts (hexagonal plates with variably resorbed margins). Augite forms oscillatory-zoned microphenocrysts (~0.2 mm). Olivine (Fo84-86) is present both as glomerocrystic clots with augite and as isolated subhedral-anhedral phenocrysts. The olivine phenocrysts are bordered by aggregates of small (<0.1x0.5 mm) hornblende laths. Anhydrite is present as sparse but relatively large (~1 mm) and highly resorbed crystals. Apatite is also present both as large euhedral phenocrysts that occur with anhydrite and as elongate microphenocrysts in the groundmass and included in plagioclase. Both ilmenite and magnetite are present as small phenocrysts and microphenocrysts (<10 m to 0.5 mm). All ilmenite crystals are bordered by magnetite rims (fig. 9D), and many grains display exsolution lamellae. Figure 9. Photographs of 1992 samples. A, Hand sample of 1992 andesite (at top, with large plagioclase phenocrysts) showing contact with basaltic andesite inclusion (dark, plagioclase-poor material at bottom of image). B, Photomicrograph (5.5 mm wide) of 1992 andesite showing olivine (OL) with hornblende rim, augite (AG), plagioclase (PL) with and without resorbed cores, and hornblende (HB) phenocrysts. C, Photomicrograph (1.3 mm wide) of hornblende (HB) phenocryst with hypersthene-rich reaction rim (CM) in 1992 andesite; hypersthene is probably pseudomorphous after cummingtonite. D, Photomicrograph (1.3 mm wide) of ilmenite (IL) with magnetite (MT) rim (center of image) in 1992 andesite. Rounded quartz (QZ), irregular vesicles (VES), and plagioclase (PL) also shown. E, Photomicrograph (5.5 mm wide) of 1992 basaltic andesite inclusion showing olivine (OL) with hornblende (HB) rim, augite (AG) phenocrysts and microphenocrysts, and lath to needle-shaped hornblende crystals in a glassy groundmass. F, Photomicrograph (0.34 mm wide) showing "hopper" shapes of plagioclase (PL) microlites in glass (GL) from 1992 basaltic andesite. VES, vesicle. G. Back-scattered electron image (0.875 mm wide) of ilmenite grains with exsolved magnetite and magnetite rims in 1992 basaltic andesite. H, Titanium distribution map (0.14 mm wide), showing magnetite (MT) grain in contact with ilmenite (IL). Grain contact is thin dark line. Lighter areas indicate higher Ti concentration. Note that Ti abundance in magnetite increases toward ilmenite contact. Map produced digitally from wavelength spectrometer output while rastering electron-microprobe stage. Table 2. Average mineral compositions and representative microprobe analyses from 1992 dome samples. Like the 1991 andesite (Pallister and others, 1992; this volume), the 1992 andesite was produced by magma mixing. Evidence for mixing includes the wide range in phenocryst species and compositions, presence of minerals that do not normally coexist in equilibrium (for example, quartz and olivine), and multiple populations of the same minerals (for example, resorbed and pristine types of both hornblende and plagioclase). Development of disequilibrium-reaction textures (hornblende borders on olivine, augite rims on hornblende, hypersthene pseudomorphs after cummingtonite, magnetite rims on ilmenite) is consistent with the suggested mixing. About 5 to 10 percent of the 1992 dome consists of dark, mostly subrounded inclusions of vesicular olivine-augite-hornblende basaltic andesite (fig. 9A). Our sample contains abundant (~40%) irregular and interconnected vesicles in a porous (diktytaxitic) groundmass texture. In contrast to the plagioclase-phyric texture of the host andesite, plagioclase is present only as microlites and as sparse xenocrysts with resorbed cores. The basaltic andesite contains phenocrysts of olivine (<0.5 to 2.0 mm), oscillatory- or sector-zoned augite (<0.5 mm), and oscillatory-zoned hornblende (fig. 9E). Most of the hornblende is similar in composition to the high-TiO2 type found in the host andesite (fig. 10); the olivine and augite phenocrysts are magnesian and overlap in composition with those in the host andesite (table 2). Hornblende occurs as phenocrysts (to 2 mm) and grades in size to elongate microphenocrysts (<0.3 mm) in the groundmass. Sparse low-TiO2 hornblende xenocrysts (to 2 mm) are extensively replaced by fine-grained augite. As in the host andesite, olivine occurs both as glomerocrysts with augite and as isolated subhedral phenocrysts bordered by hornblende. Sparse quartz xenocrysts are highly resorbed and rimmed by glass and augite. Apatite needles are common in the groundmass glass and as inclusions in plagioclase microlites. Magnetite microphenocrysts (<0.1 mm) are the only primary oxide; however, a few large (to 0.7 mm) ilmenite xenocrysts are present. These are rimmed by magnetite and contain exsolution lamellae of magnetite. A sulfide mineral is present as small (<10 m) blebs within the groundmass and as inclusions in some magnetite, augite, and hornblende crystals. Figure 10. Variation of TiO2 and Al2O3 in hornblende phenocrysts in samples from the 1992 Pinatubo dome. Note the bimodal distribution and lack of high-TiO2 and high-Al2O3 hornblende in the dacite sample. The basaltic andesite inclusions show evidence of rapid microlite growth at a late stage, presumably due to rapid cooling upon entrainment in the cooler andesite host magma. The diktytaxitic groundmass texture consists of randomly oriented microlites (hornblende, plagioclase, augite, oxides) enclosed in clear to brown vesicular glass. Elongate hornblende microlites and abundant plagioclase microlites attest to a late period of rapid crystal nucleation. Small (<50 m) plagioclase microlites have "hopper" shapes, and "swallow-tail" terminations are observed on some hornblende needles (fig. 9F). These textures indicate undercooling and rapid crystal growth. Similar textures are seen in basaltic inclusions from the 1991 dome and are described in more detail by Pallister and others (this volume). Sparse dacitic inclusions occur within the dome andesite. The sampled inclusion is a dense hornblende-plagioclase dacite with <5% small, irregular vesicles and a microlite-charged groundmass. Although the groundmass appears partly isotropic in polarized light, electron imagery shows it to be microcrystalline and composed mainly of intergrown silica, albite, and potassium feldspar. The microcrystalline groundmass suggests that the dacite had cooled and solidified prior to inclusion in the hotter andesite. The dacite contains about 40% phenocrysts, mainly of oscillatory zoned plagioclase and hornblende, and accessory quartz, biotite, ilmenite, magnetite, resorbed anhydrite, and trace amounts of apatite and zircon. Plagioclase forms large oscillatory zoned phenocrysts with average compositions of An35-40. These crystals typically contain several resorption surfaces, each of which is bounded by more calcic zonal bands that approach An60 (table 2). Individual magnetite grains lack exsolution lamellae, yet they range in TiO2 from 4 to 7 wt%; (table 2). Maximum TiO2 abundances occur along grain boundaries with ilmenite and decrease exponentially away from those contacts (Figure 9H). Fe-Ti-oxide thermobarometry yields apparent temperatures of 900 to 1000°C and oxygen fugacities of 10-10 to 10-9 for these high-TiO2 zones. Thermobarometric calculations that use the low-TiO2 core areas of magnetite grains yield apparent temperatures and oxygen fugacities in the range 760 to 800°C and 10-12 to 10-11 (table 2). Although these results do not represent equilibrium conditions, they suggest that the dacite was heated upon inclusion in the hotter andesite but that there was insufficient time between inclusion and eruption for complete reequilibration. The TiO2 gradient within magnetite grains may represent diffusion of titanium into magnetite between the times of inclusion and eruption. Hornblende phenocrysts in the dacite are of the low-TiO2 type (table 2; fig. 10). They show oscillatory zoning and are mantled either by 5- to 10-m-thick reaction rims or by 50- to 150-m-thick reaction rims. The thin rims are present where hornblende is in direct contact with the groundmass but are not present where hornblende is in contact with other minerals. They occur not only along the outer growth surfaces of hornblende phenocrysts but also along broken surfaces that cut through phenocryst cores. The thin rims contain blocky microlites of augite, hypersthene, and glass, and in some areas also contain plagioclase and oxides. They are similar to the depressurization reaction rims described in dacite of Mount St. Helens by Rutherford and Hill (1993). The thick rims are composed of fibrous aggregates of hypersthene, glass, and minor oxides. As in the 1992 andesite, the similarity in thickness of the hypersthene-rich rims to cummingtonite rims in 1991 and earlier dacites of Mount Pinatubo and the occurrence of hypersthene-rich rims that are only present on the outer growth surfaces of crystals suggest that they represent pseudomorphs after former cummingtonite rims. The mineral assemblage and phenocryst-rich character of the dacite is similar to the dominant type of dacite erupted on June 15, 1991. However, the microlite-rich groundmass and evidence of late-stage reaction of hornblende, cummingtonite, and anhydrite show that this dacite ascended more slowly and degassed en route to the surface. In fact, the microcrystalline groundmass and Fe-Ti oxide evidence of heating suggest that our sample of the dacite was not magmatic when included. Major element compositions for the 1992 dome andesite and its dominant inclusion type are given in table 3. The bulk composition of the 1992 dome sample is broadly similar to the average composition of the 1991 andesite, although the 1992 sample has slightly higher SiO2 and lower MgO, CaO, and total iron. Our analyzed 1992 inclusion is texturally similar to basaltic inclusions of the 1991 dome but has more SiO2, Al2O3 and Na2O, less MgO, CaO and total iron, and a lower magnesium number (62) than do basaltic inclusions of the 1991 dome. Olivine crystals in the 1992 samples are about Fo86 in composition, similar to those in the 1991 samples and indicating that the primary mafic mixing endmember was basaltic, with a magnesium number of about 68 and a temperature of >1200°C (see discussion of olivine-melt equilibria in Pallister and others, this volume). The lower magnesium number of the basaltic andesite and the presence of sparse plagioclase, low-TiO2 hornblende, and ilmenite xenocrysts suggest that our 1992 inclusion represents basaltic magma that had already mixed with a small amount of dacite prior to entrainment in the andesite. Table 3. Major and trace element analyses of 1992 dome rocks compared to average compositions of 1991 eruptive products. 1 Least squares model (38% 1992 basaltic andesite + 62% 1992 dacite), deviation of 1992 andesite from model composition expressed as percent difference. Least squares modeling of major and trace element data shows that the 1991 andesite composition can be produced by mixing of dacite and basalt in the proportions 64:36 (Pallister and others, this volume). Application of the same 1991 dacite-basalt model to produce the 1992 andesite composition yields proportions of 72:28, with an unacceptably high sum of squared residuals of 0.6 (table 4). On the basis of our experience modeling the 1991 rocks and the analytical uncertainties reported in table 2, we expect the sum of squared residuals for an acceptable model to be less than 0.2. When this criterion is used, none of the two-component mixing models that use a 1991 composition produce an acceptable fit. Although the fit of 1991-based models can be improved by adding or subtracting minor amounts of the observed mineral phases, an acceptable fit can also be obtained by using only 1992 compositions. For example, the best-fit two-component mixing model is obtained by mixing 62% 1992 dacite with 38% 1992 basaltic andesite. Table 4. Results of least squares models to produce the 1992 andesite and 1992 basaltic andesite compositions by simple two-component mixing. We reject the 1991-based models for the following reasons: The composition of the 1992 basaltic andesite inclusion is distinct from compositions of 1991 magmas, and it cannot be produced by any combination of 1991 or 1992 endmember magmatic compositions (table 4) or by any reasonable combination of mixing and removal or addition of major phenocryst phases. In addition, trace-element abundances and patterns of each of the 1992 samples are distinct from their 1991 counterparts. In particular, the 1992 samples show enrichments in the light rare earth elements compared to their 1991 counterparts (fig. 11). As in the 1991 samples, the most mafic composition is also the most enriched with respect to incompatible element abundance. This relation rules out major phase fractionation to produce the more felsic magmas. The basaltic andesite is enriched in light rare earth elements and depleted in heavy rare earth elements relative to the 1991 basalt; it is a crossing pattern, which also indicates that the basaltic andesite is not a simple fractionate of the 1991 basalt. Figure 11. Chondrite-normalized rare earth element patterns for 1992 Pinatubo samples compared to patterns for average abundances in 1991 samples. The two-component 1992-based mixing model (62% 1992 dacite with 38% 1992 basaltic andesite) is capable of reproducing 30 of the 36 oxide and elemental abundances in table 3 within two standard deviations of the combined errors. With respect to the analyzed 1992 andesite sample, the model solution is depleted by 3 to 15% in K2O, Rb, Cs, Sc, Cr, and Zn, and possibly in As and Ni. This indicates that although our 1992 samples of dacite and basaltic andesite are close, they are not completely representative of the true mixing endmembers, which were not sampled. This is not surprising, given the textural evidence that the 1992 dacite was not magmatic when included. However, the textural and chemical evidence that the 1992 andesite is a mixed magma is conclusive. We suspect that it was produced by mixing of a basaltic magma that was parental to the 1992 basaltic andesite inclusion with dacitic magma that is represented by the 1992 dacite inclusion. The 1992 dome is similar to the dome that formed just before the major explosive eruptions of 1991. Both domes are composed mainly of andesite that formed by mixing of basalt and dacite. However, in sharp contrast to events of 1991, extrusion of the 1992 dome was not followed by significant explosive activity. Is the 1992 andesite left-over mixed magma from the same batch that was first erupted on June 7, 1991, or does it represent a new episode of magma mixing in 1992? If new mixing has occurred, the dacitic magma reservoir is still being replenished by mafic magma, and a strong possibility of further eruptions remains. On the other hand, if the 1992 andesite is part of the 1991 batch that was stored in the reservoir or conduit system, its eruption would not indicate replenishment and accompanying disturbance of the main dacite reservoir at depth. The slightly more siliceous composition of the 1992 samples, our inability to produce the 1992 compositions by two-component mixing involving 1991 components, and the distinct trace element patterns of the 1992 samples indicate that they are not unerupted aliquots of the magma that formed the June 7-12, 1991, andesite dome and the June 12, 1991, andesite scoria. Instead, they represent the products of a new mixing event. Unreacted cummingtonite rims on hornblende, and unhomogenized magnetite-ilmenite pairs, suggest that less than 4 days elapsed between the final stages of magma mixing and eruption in 1991 (Rutherford and others, 1993; Rutherford and Devine, this volume). Conversely, the breakdown of cummingtonite rims observed in the 1992 andesite sample indicates that more than 4 days elapsed between mixing and eruption in 1992. We envision that some of the "1992" dacitic magma rose from the main reservoir (>8 km depth) and reached depths where hornblende was not stable (<4 km, Rutherford and Devine, this volume). Ascent took place sometime after June 15, 1991, and before July 1992. The dacite body cooled around its margins and developed a microcrystalline groundmass. Then, in mid-1992, magnesian olivine basalt (Mg#=68) intruded the >8-km-deep dacitic reservoir and mixed first with a small amount of similar "1992" dacitic magma to form basaltic andesite and then with a larger volume of the same "1992" dacitic magma to form andesitic magma. Days or perhaps weeks later, the andesitic magma rose toward the surface, picked up the xenolith that is our only surviving sample of "1992" dacite, and was erupted to form the 1992 lava dome. Preservation of Ti-zonation in magnetite (fig. 9H) indicates that the xenolith was included and heated by the andesitic magma for only a brief period before the eruption. The lack of another explosive dacite eruption in 1992-93, despite evidence for renewed replenishment and magma mixing, suggests that eruption from the large residual dacite reservoir (Mori, Eberhardt-Phillips, and Harlow, this volume) is no longer easily triggered. 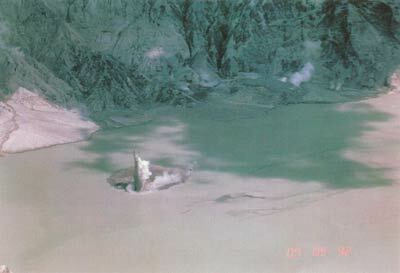 The climactic eruption of June 15, 1991, certainly depleted volatiles in the dacitic reservoir, perhaps to such a low level that large eruptions will be unlikely until volatiles can reconcentrate in the upper parts of that reservoir. Alternatively, the mixing episode in 1992 may have been too small to trigger an explosive eruption from the dacitic reservoir. The total volume of andesitic magma erupted in 1991 (June 7-12 dome and June 12 tephra) was between 107 and 108 m3; the volume of andesitic magma erupted to form the 1992 dome and left in a hypothetical conduit beneath that dome was of the same order of magnitude. Thus, we suspect that volatile depletion in the dacitic reservoir is preventing further large eruptions, but we cannot rule out that a larger intrusion of basalt than occurred in 1992 could still trigger a large eruption from the dacitic reservoir. We are grateful to the Philippine Air Force and the U.S. Marine Corps for photographic air support. Various colleagues kindly shared their photos, video, and sketches. We are also grateful to Ms. Tina Monzon-Palma (Channel 5, Manila) and the late Captain Agustin Consunji for helicopter access to the crater to sample the 1992 lava dome. Don Swanson and Jon Fink provided helpful reviews. Andersen, D.J., and Lindsley, D.H., 1988, Internally consistent solution models for Fe-Mg-Mn-Ti oxides: Fe-Ti oxides: American Mineralogist, v. 73, p. 714-726. Anderson, S.W., and Fink, J.H., 1992, Crease structures: Indicators of emplacement rates and surface stress regimes of lava flows: Geological Society of America Bulletin, v. 104, p. 615-625. Daag, A.S., Tubianosa, B.S., Newhall, C.G., Tuñgol, N.M, Javier, D., Dolan, M.T., Delos Reyes, P.J., Arboleda, R.A., Martinez, M.L., and Regalado, M.T.M., this volume, Monitoring sulfur dioxide emission at Mount Pinatubo. Jones, J.W., and Newhall, C.G., this volume, Preeruption and posteruption digital-terrain models of Mount Pinatubo. Mori, J., Eberhart-Phillips, D., and Harlow, D.H., this volume, Three-dimensional velocity structure at Mount Pinatubo, Philippines: Resolving magma bodies and earthquakes hypocenters. Mori, J., White, R.A., Harlow, D.H., Okubo, P., Power, J.A., Hoblitt, R.P., Laguerta, E.P., Lanuza, L., and Bautista, B.C., this volume, Volcanic earthquakes following the 1991 climactic eruption of Mount Pinatubo, Philippines: Strong seismicity during a waning eruption. Nakada, S., 1992a, Photographic records of eruption products at Unzen Volcano during May 1991-May 1992, in Yanagi, T., Okada, H., and Ohta, K., eds., Unzen Volcano: The 1990-1992 Eruption: Fukuoka, Japan, The Nishinippon and Kyushu University Press, p. 12-20. -----1992b, Lava domes and pyroclastic flows of the 1991-1992 eruption at Unzen Volcano, in Yanagi, T., Okada, H., and Ohta, K., eds., Unzen Volcano: The 1990-1992 Eruption, The Nishinippon and Kyushu University Press, Fukuoka, p. 56-66. Newhall, C.G., Daag, A.S., Delfin, F.G., Jr., Hoblitt, R.P., McGeehin, J., Pallister, J.S., Regalado, M.T.M., Rubin, M., Tamayo, R.A., Jr., Tubianosa, B., and Umbal, J.V., this volume, Eruptive history of Mount Pinatubo. Omori, F., 1916, The Sakura-jima eruptions and earthquakes: Tokyo, Bulletin of the Imperial Earthquake Investigation Committee, v. 8, p. 181-321. Pallister, J.S., Hoblitt, R.P., Meeker, G.P., Knight, R.J., and Siems, D.F., this volume, Magma mixing at Mount Pinatubo: Petrographic and chemical evidence from the 1991 deposits. Pallister, J.S., Hoblitt, R.P., and Reyes, A.G., 1992, A basalt trigger for the 1991 eruptions of Pinatubo volcano? : Nature, v. 356, p. 426-428. Ramos, E.G., Laguerta, E.P., and Hamburger, M.W., this volume, Seismicity and magmatic resurgence at Mount Pinatubo in 1992. Rose, W.I., Jr., 1972, Santiaguito volcanic dome, Guatemala: Geological Society of America Bulletin, v. 83, p. 1413-1434. ------1973, Pattern and mechanism of volcanic activity at the Santiaguito volcanic dome: Bulletin Volcanologique, v. 37, p. 73-94. ------1987, Volcanic activity at Santiaguito volcano, 1976-1984, in Fink, J.H., ed., The emplacement of silicic domes and lava flows: Geological Society of America Special Paper 212, p. 17-27. Rutherford, M.J., Baker, Leslie, and Pallister, J.S., 1993 Petrologic constraints on timing of magmatic processes in the 1991 Pinatubo volcanic system [abs. ]: Eos, Transactions, American Geophysical Union, v. 74, p. 671. Rutherford, M.J., and Devine, J.D., this volume, Preeruption pressure-temperature conditions and volatiles in the 1991 dacitic magma of Mount Pinatubo. Rutherford, M.J., and Hill, P.M., 1993, Magma ascent rates from amphibole breakdown: An experimental study applied to the 1980-1986 Mount St. Helens eruptions: Journal of Geophysical Research, v. 98, p. 19667-19685. Stormer, J.C., 1983, The effects of recalculation on estimates of temperature and oxygen fugacity from analyses of multi-component iron-titanium oxides: American Mineralogist, v. 68, p. 586-594. Swanson, D.A., Dzurisin, D., Holcomb, R.T., Iwatsubo, E.Y., Chadwick, W.W., Jr., Casadevall, T.J., Ewert, J.W., and Heliker, C.C., 1987, Growth of the lava dome at Mount St. Helens, Washington (USA), 1981-1983, in Fink, J.H., ed., The emplacement of silicic domes and lava flows: Geological Society of America Special Paper 212, p. 1-16. Swanson, D.A., and Holcomb, R.T., 1989, Regularities in growth of the Mount St. Helens dacite dome, 1980-1986, in Fink, J.H., ed., Lava flows and domes: Emplacement mechanisms and hazard implications: New York, Springer-Verlag, IAVCEI Proceedings in Volcanology No. 2, p. 3-24. Taylor, G.A.M., 1958, The 1951 eruption of Mount Lamington, Papua: Australian Bureau of Mineral Resources Bulletin, v. 38, 117 p.